One Man's Ramblings, v.2: A shock, and then motivation. Several years ago my wife gave me a Handspring Visor. I loved this gadget, but it quickly grew outdated. 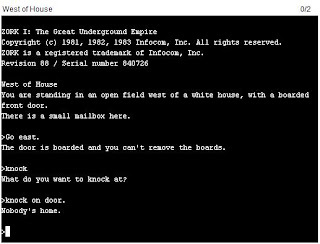 A couple of decades ago there was a computer game called Zork. Zork spawned a genre of game known as the 'text adventure', or, as they are now known, Interactive Fiction games. In Interactive Fiction (IF) games, there are no graphics, no sound, and no hand-eye coordination requirements. The game will describe a situation, and the player responds by typing in his commands. Nearly all IF games may be played through what's called a 'Z-Machine' interpreter. There are freely downloadable Z-Machine interpreters for just about every computer device imaginable - old computers, new computers, the Dreamcast videogame system, most mobile devices, I think even the iPod has one! Well, I installed a couple of interpreters on my trusty Visor, and while they worked OK, the Visor was pretty slow for these programs. Some of the newer IF games were too taxing for the Visor, and each input would take about 2-3 minutes to process. This rendered the game unplayable. So for a long time I wanted a new, more powerful PDA that I could use to play these games at an acceptable speed. This past week, as mentioned below, I got myself a brand-new T-Mobile Dash. The Dash is a really neat, Windows Mobile PDA/smartphone. The phone was supposed to have Windows Mobile 6.0, but 6.0 only came out this past week, and my unit happened to still have Windows Mobile 5.0. 6.0 is a free download and upgrade, if I decide to do it. Windows Mobile 5.0 is on millions of smartphones and PocketPCs worldwide. It's a very mainstream, very popular system, and has been out for at least a couple of years. Surely there is a Z-Machine interpreter available for WM5. Well, it turns out, there *IS* a Z-Machine application for Windows Mobile 5. It simply is incompatible with my T-Mobile Dash! Argghh! I was so incredulous that there is no Z-machine for my very popular and common PDA/phone, that I searched the 'net for hours thinking I'd find something. Nope. Nothing's out there. Well, many years ago, before giving up my thoughts of becoming a programmer, I decided I wanted to learn C++. I never got a round tuit, though. There are several open-source Z-machine interpreters. Open source means I can look at the source code and see how the program is written. I don't know that I'll ever finish the job, but I'm going to try and write a Z-Machine interpreter for my Dash. Microsoft has some tutorials for developing Windows Mobile software, and they suggest using C++. So maybe I'll teach myself C++ after all.